Sometimes seeing things being done is much easier to understand than any amount of written instruction. I found William Smith's series of videos to be very useful, especially the graver making and the gear cutting videos. "This 2-hour video is filled with unusual workshop tooling & techniques. Learn eight ways to index a lathe, including CNC. Learn how to make index plates from scratch. See the cutting of internal and external teeth on a ring gear of 4.5 " ID and 5.5 " OD. Watch concave and convex turning on a standard non-CNC bench lathe. See how easily a damascene pattern can be created on a surface with the simplest of tooling. Watch how a lathe can be used to remove and replace in-barrel, heavy duty mainsprings. Learn a simple way to remove lantern pinion pins and replace them without the purchase of special tools. Watch the use of a complete Sherline headstock assembly mounted at lathe center height for radial drilling See it being used as a vertical mill, or being used for cutting gear teeth. Watch a 19.1" OD Masonite disk being machined on a 7" Myford Super 7B lathe! Learn a simple method for the end to end transfer of circumferential spacing on cylinders. See how easily the direction of rotation of a sewing machine motor can be reversed. Watch the replacing of a broken pivot. See three mainspring length gages, each of which can indicate the correct length of an in-barrel spring without measurements or calculations. Watch the use of the ingenious McDuffIe drive system being used for powering live spindles on the bench lathe. This extremely detailed video is a remarkable source of information for the serious craftsman—clockmaker, modelmaker or machinist." "Gravers for hand turning operations are among the most useful of all cutting tools available. Because they are used freehand, considerable time can be saved by avoiding the need for form tools. And they are fast. 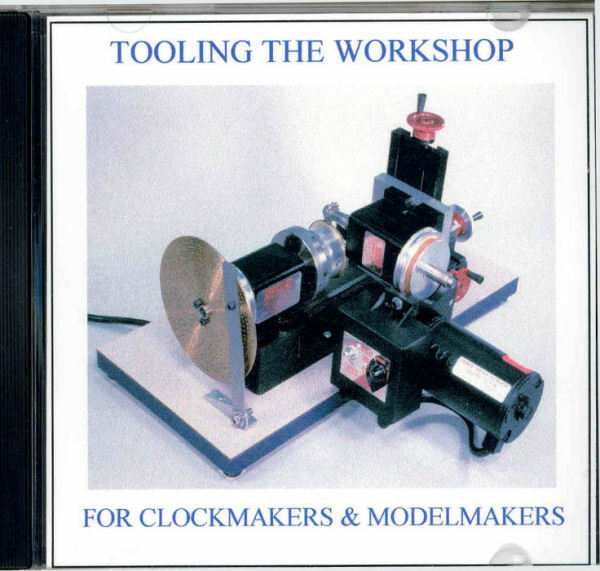 Thus, this 2-hour video is a must for clockmakers and modelmakers. For example, a 1/16” OD pivot 3/16” long can be cut on a 1/8” OD tempered steel rod, the end of the pivot rounded and the shoulder chamfered in less than 1-minute." It shows how to make gravers from the finest available steel and develop the skills required for using them. A unique and rapid technique for shaping gravers on a bench grinder and honing them with only four or five strokes on an India stone is demonstrated. This method is the fastest of all hand sharpening methods and has never before been offered in the literature. An enlarged model is used for demonstrating the basic hand turning techniques. A method for making the handles is also demonstrated. These gravers will cut almost every metal encountered in the clock shop without the need to resort to the use of tungsten carbide tools, which chip far too easily to be useful for most work. This video can teach you more in two hours than you would learn on your own in most of a lifetime." 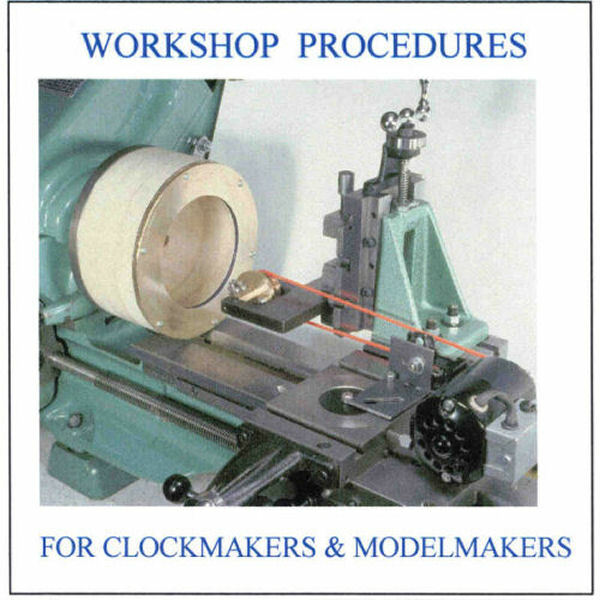 "This 2-hour video, made in the W. R. Smith workshop, explains in details the methods for calculating clock wheels and pinions using the wheel cutter module, M. These yield the circular pitch, the wheel blank OD, the lantern pinion pitch circle diameter and the pinion pin diameters. Various ways for mounting wheel blanks are discussed, leading to the choice of the W. R. Smith super glue arbor, which allows more work to be done on the mounted wheel blank than any other type arbor. After the blank has been mounted, details are shown for determining the proper depth for the wheel cutter, and the proper techniques for cutting the wheel teeth. The design for a depthing tool is offered and detailed instructions of its use for finding the correct center distance between the wheel and pinion pivot holes is demonstrated. This is the video needed by those wishing to learn how to cut clock wheels and make lantern pinions from scratch. It will help avoid the many “boat anchors” bought by people in their efforts to learn the proper way to make clock wheels and lantern pinions." "This 2-hour video is extremely detailed and offers many things: See how a bench lathe can be configured to do horizontal milling work by the use of an inexpensive mill drill spindle. See how a simple riser block can allow vertical milling on the same lathe. Learn to use the dividing plate and mill/drill spindle for cutting gears and pinions. Watch the free hand grinding of sheet metal drills, which cut a truly circular hole in extremely thin metal. Examine a simple motor mount for driving mill/drill spindles on three axes. Learn how simple it is to make an index plate from scratch and without the need for another dividing plate or index head. Watch how slide locks can be added to a Sherline lathe. See the hand turning of hardened and tempered steel in a Sherline lathe using the W. R. Smith T-rest, now being offered by Sherline. See how to make a saw table for the T-rest. Learn how to make a filing rest and index a Sherline lathe for filing triangles, squares, hexes, etc. Learn the free-hand grinding of fly cutters and the hardening of them by the disappearing shadow method. Then watch the tempering of these cutters by the heat/color method. See how easily carbon steel parts can be blued with heat fora nice finish." A visitor to this site recommended this DVD, I recall running across the website before (click here), but had forgotten about it. It is a excellent video, Mr. Matthews demonstrates making a pair case from scratch, including forming the dome and bezels, hingemaking, spring and latch, pendant gutters, and also a replacement bow. He uses antique tools, but these are the same as Daniels describes in 'Watchmaking'. Interesting to see these tools and how they work. Useful even if one must use or adapt modern tools. 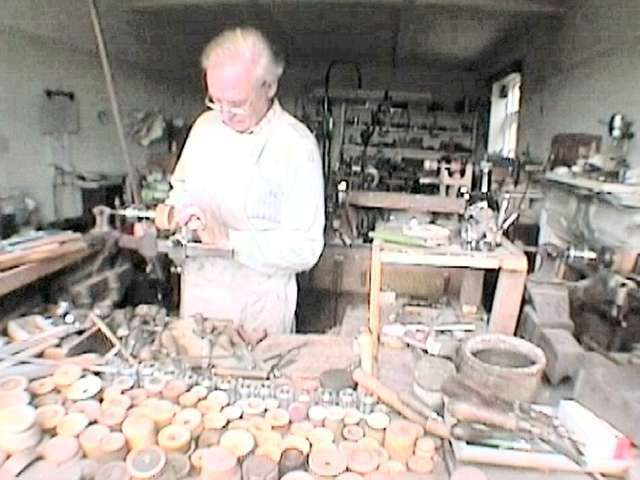 The video mentions Mr. Oliver, another Clerkenwell case maker who taught Daniels how to make a case. Rudy Kouhoupt Videos - Mr. Kouhoupt wrote and produced numerous articles, books and videos on various aspects of model engineering and machine tool use. I list several videos below, which I found to contain excellent basic knowledge on machining fundamentals. His videos are available from Bay-Com.com. Good instructional DVD on making lathe tools on a bench grinder, and demonstrates a homemade jig for maintaining proper angles. Covers how to 'read' technical plans and the various types of layout tools available and how to use them. Demonstrates the same layout using progressively more advanced tools, showing simple tools (a square, scriber, divider and scale) and more advanced (surface plates, angle plate, scribing block and height gauge). Video is useful for those of us who use CAD to draw and never learned basic drafting skills, using hand tools to properly lay out work onto metal sometimes requires some techniques/tricks, such as using a divider to bisect an angle or line, draw polygons, etc. Covers all the basic lathe operations, and demonstrates them by making a boring bar toolpost. All instruction in on a 9" Southbend lathe. As the title implies, the video covers more unique setups on the lathe which demonstrate the numerous machining operations that can be carried out on the lathe, with some ingenuity. Covers work such as using a between centers boring bar to bore a large casting mounted on the cross slide. A very complete video instruction on use of a SouthBend 10"x36" Toolroom lathe. Total of 12 hours of instruction. Includes very basic skills, decimals, fractions, micrometer, verneir, etc. There are details on many lathe procedures. I made a testbar based on the methods shown in this video. Camera view is sometimes by use of a mirror over the lathe, so image is reversed, can be confusing. He demonstrates tool grinding on a belt sander, which I had not seen before. The instructor, Darrell Holland, is a good teacher, and the presentation well thought out. I heard it described as vocational in tone, and I suppose it is intended that way. A set of five DVDs that give a basic introduction to using a lathe. The videos are very informal and a bit entertaining. 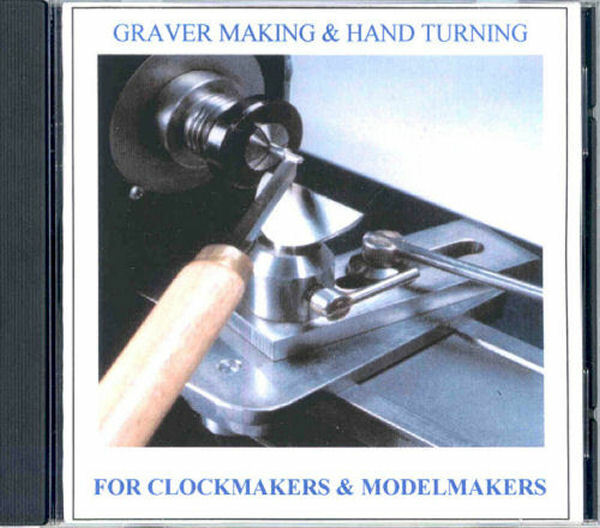 Not especially useful for someone interested in horology or using a small lathe. The instruction is mostly done on a massive toolroom type lathe, the smallest lathe he demonstrates is a 6 inch Atlas. However, the general principles are valid for any size machine. The video also covers tool grinding. The videos can be found on the following website.